We’ve all been in the position of having really important things to do at work but which don’t get done. Some people have a knack for being productive, and getting much more completed in the working day whilst others, despite being in the office for the same amount of time, seem to struggle. This post is around how you, and your team, can increase your output through following one simple rule in how you structure your day. The American writer is credited with many tomes, one of which we are discussing in this post. This concept was applied to the business sphere in the book Eat That Frog! by Brian Tracy which sets out a procedure and mindset around improving you and your team’s personal output through how tasks are approached. The rationale behind eating the frog first is as follows. We know that in the long list of things we should be doing each day there are those which we like doing, and those which are important. We naturally gravitate towards those tasks which we like doing because, well, they’re enjoyable, but as a result the tasks which are really important get pushed back. As the day goes on, distractions come bounding in and we sit down to tackle the important task there are invariably meetings to be pulled into, or coffees to attend, or generally our tired brains get more easily lured away by emails dropping in our inbox. By the time the day is up invariably that really important thing we were meant to do gets left behind, which either results in postponement of projects, or staying late in the office, neither of which are good outcomes. The way in which this is overcome is by tackling the most important task as the first thing you do. Before other tasks are even considered, focus on getting the worst task out of the way. After that, everything will seem much more appealing, and you’ll also have the momentum of already overcoming the toughest part of your day. It all starts with a list. Ideally, the night before you set out a list of the things which you wish to complete the following day. Include things which are fixed in your calendar, such as client meetings, and also other tasks which you typically do too, such as replying to emails and meeting X for a coffee. From here look at each task and split them into those which are important, and those which you want to do. Decide on how you’re going tackle this particularly important task and then identify the things which you need to do in order to complete it when you come in in the morning. Each time that you “switch contexts” to answer an email then it takes you a comparatively long time to regain focus on what you were doing. The important task which, remember, your brain will find any excuse to stop doing will likely require your undivided attention. Any time an email pops up and takes you away from doing it, you lose the momentum you had in getting to the finish line, and it will take much longer to get back up to speed and complete it. On your list of things you want to do, there will likely be tasks which you particularly enjoy. This could include clearing your inbox, tidying your desk, or catching up with clients. From the perspective of having done the worst task of the day already, these tasks will be much more appealing and so can viewed as a reward for later in the day. You’ll find yourself relishing in doing these tasks without the pang of knowing that there’s something else you really should be getting back and doing. As owner/ manager of your team you will have interactions with many others in your organisation. If the status quo in your company is to, say, have a catch up meeting first thing in the morning, then that will likely be at just the moment you were intending on eating your frog. As we’ve discussed, breaking your concentration, and opening yourself up to a barrage of requests makes returning to eating the frog much more difficult, if not impossible. To this, there are some responses. Get the most important thing done before coming to the office when others are there to distract you, or alternatively come in early when no-one else is there and you have the serenity to get it done. It might be that having an 8.30am meeting is “just the way things have always been done”. If, say, you’re running a sales team you might have the perspective of needing to update on how the previous day went, and what is happening today. But does that need to be the first thing to happen? Each industry/ team will have different preferences, but challenge the assumption that pulling everyone into a meeting room at the beginning of the day is the most productive use of time when, instead, everyone could be tackling their worst/ most important task of the day. Having your workforce in sync around eating their frogs at the same time, or at minimum communicating that this is a technique which you’ll be trying, will allow them to adapt to when they bring tasks for you, or ask for your sign off. 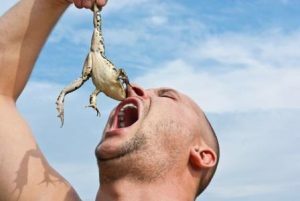 Eating the frog is a pithy summation of a productivity technique that you probably intuitively knew already. The trick is in recognising what counts as a distraction, and being disciplined around blocking them out. E.g. replying to a few emails, or quickly confirming something with the Finance Team might not seem like distractions, but with your limited cognitive energy and tendency to avoid the task it can easily mean that the frog gets left uneaten. So get started with this today. Send a quick email to the team saying it will be later on in the morning until you can be available for feedback etc. And then tomorrow, once you’ve completed the main task, see how you feel throughout the day knowing that the worst is behind you..!